fine new book, “I Is an Other,” [in which] James Geary reports on linguistic research suggesting that people use a metaphor every 10 to 25 words. Metaphors are not rhetorical frills at the edge of how we think, Geary writes. They are at the very heart of it. Most of us, when asked to stop and think about it, are by now aware of the pervasiveness of metaphorical thinking. But in the normal rush of events. we often see straight through metaphors, unaware of how they refract perceptions. So it’s probably important to pause once a month or so to pierce the illusion that we see the world directly. It’s good to pause to appreciate how flexible and tenuous our grip on reality actually is. Most important, being aware of metaphors reminds you of the central role that poetic skills play in our thought. If much of our thinking is shaped and driven by metaphor, then the skilled thinker will be able to recognize patterns, blend patterns, apprehend the relationships and pursue unexpected likenesses. The Dharma is like an Avocado! Some parts so ripe you can’t believe it. Pleasing those who like their eggs well-cooked. Brooks exposes the individualistic, materialistic, uber-rational philosophies of the past and present as single-faceted paradigms which ignore much of what is true about human nature. Brooks notes that this focus “has created a distortion in our culture. We emphasize things that are rational and conscious and are inarticulate about the processes down below,” to our collective detriment. In particular, Brooks recognizes that “When we raise our kids, we focus on the traits measured by grades and SAT scores. But when it comes to the most important things like character and how to build relationships, we often have nothing to say.” The message to students, which often becomes internalized, is that you are the sum of the numbers, or letter grades, and your worth is tangibly related to the outcomes. This message takes years to unwind, and that’s only for the lucky ones. Some people wind up tangled in the web of conflicting messages between innate human desires for social success or pleasing loved ones and their internal feelings of boredom, hatred, or disinterest in what they have been told makes them valuable. Who likes taking the SAT, and what happens when it’s over (answer: the GRE)? Who is motivated endlessly by a score; everyone gives up on Galaga eventually, because the numbers begin to look alike, or be meaningless. In fact, intrinsic motivation is identifiable most often in non-measurable forms. Equipose and metis are essential “talents,” or, more appropriately, learnable skills for most people. Courses like Advanced Placement Literature & Composition are arguably useful not because they make learners smarter, but because they lead learners to reflect and monitor their own understandings and skills, changing as they individually must: equipose. Or, useful because the course demands higher order thinking skills and integration of complex sets of data in the form of texts for synthesizing new understandings: metis (at least partially, or within a given set). If taught correctly, a course builds a sense of honest, authentic engagement, possibly limerence: loss within the challenge of a task, questing for Phaedrus’s Quality. But, the AP falters badly in May, testing, assigning a number. I love my task, I’m playing the game, and questing for improvement, but I’m not going to score perfectly on the AP test, so how likely am I to give myself to the task? To experience limerence? If it were me, and it has been, the answer is not bloody likely. So the tests, the measurements, don’t help honest, prolonged engagement, but rather feed into our “rational,” materialistic selves. The symptoms are cramming, learning disposably, and widespread misery. Oh, how I wish for schools in which humans teach humans, explicitly, in which we respect our different strengths, foibles, blind spots, and in which we all seek to become more happy, healthy, and complete humans together through this shared process called school. Usually, we change and grow silently, invisibly. Sometimes, changes in our brains become obvious and pop out in crystalline detail. Only once, poop and pee has crystallized a real change in my life. Yesterday, my wife, Kal, looked at our daughter of 2 1/2 years, Dot, and asked “Do you feel peeps muzza-muzza?” This sentence has meaning, unbelievably. Kal’s links with this sentence begin in the deep past, her own toddlerhood. For some reason, pee, or its hyphenated variant pee-pee, wasn’t enough for her mother, wasn’t cute enough, sweet enough, or unique enough. 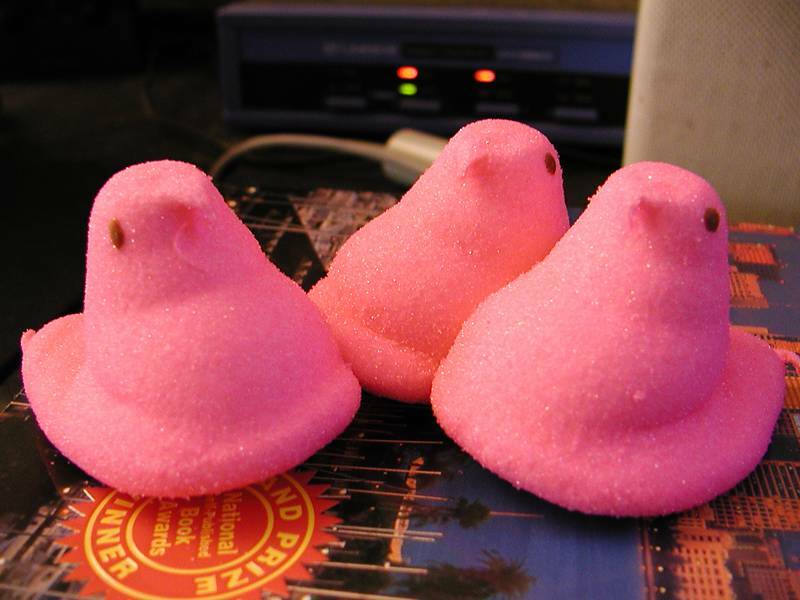 So pee became peeps, which are offensively sweet marshmallow birds in my experience, capitalized. Peeps. So, peeps is the language in our house for pee-pee. It works – it’s fun to say and the peeps meme is embedded deeply within Dot’s language understanding. Poop is also plural, in effect. Poops muzza-muzza is also a phrase, with true and useful meaning. So, how did the entire phrase gain meaning? Dot was showing mixed interest in potty training, sometimes willing to try the potty when prompted, but often having accidents that seemed to be increasing, rather than decreasing over time. We tried candy, stickers, high fives. Still, motivation was flagging amongst us all. Shimajiro is a very popular cartoon character in a wide ranging series of cartoons for teaching kids skills and etiquette. When Shimajiro is ready to hit the head, he proclaims a feeling of “muzza-muzza,” or possibly wuzza-wuzza, which is what I hear. Of course, it doesn’t really matter. Shimajiro, via Youtube, gave Dot a vocabulary for bladder and large intestinal pressure. Overnight, she was into the potty. Dot was taking responsibility for heading to her potty and taking care of business. For Dot, the language is real; she has no reason to question the meaning behind these words. But, even more interesting to me is how seamlessly Kal and I have integrated this new language into our daily experience. Kal didn’t think before she asked if Dot felt peeps muzza-muzza, because she didn’t have to. The language was integrated already and part of a communication circuit with Dot. Via Japanimation on Youtube.